Node.js support for the KCL is implemented using the MultiLangDaemon. The core of the KCL logic (communicating with Amazon Kinesis, load balancing, handling instance failure, etc.) resides in Java, and Amazon KCL for Node.js uses the multi-language daemon protocol to communicate with the Java daemon. You can view a detailed tutorial for getting started with Amazon KCL for Node.js on GitHub. The KCL is also available for other languages, such as Java, Python, and Ruby. 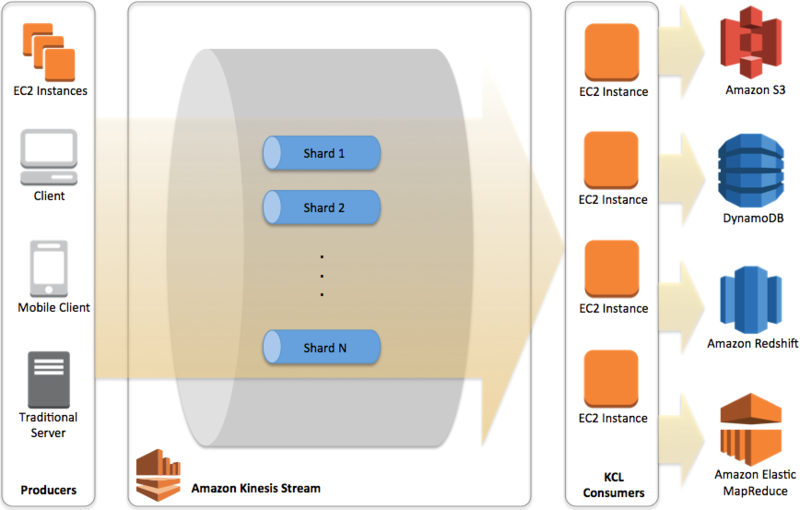 Producers, which can be EC2 instances, traditional servers, or even end-user devices, generate and put data into an Amazon Kinesis stream. The stream consists of one or more shards, each of which supports a fixed number of put transactions and throughput. Consumers retrieve data from the stream in real-time using the Amazon Kinesis API or KCL for processing. Processed data can be sent to a number of other services for archival, querying, or batch processing depending on the specific use case. There are several ways to pass credential information to the AWS SDK library. This is discussed in detail in the Getting Started guide for the AWS SDK in Node.js. // Create the new stream if it does not already exist. // you start pushing data. // checking the state again. After the stream is created, you can start putting data into the stream. In the example below, we put random data in the stream. And now, to tie everything together, the following example invokes functions to create a new stream with two shards and put data into the stream after the stream becomes active. Assuming that you have at least one producer that has sent or is actively sending data to the stream, the example below shows how to use the Amazon KCL for Node.js to consume data from the stream. initialize – invoked one time at the beginning of the record processing for the specific shard. Your application’s initialization logic can be implemented in this function. For example, if you are saving processed data in Amazon S3, then you may create an S3 client here. processRecords – invoked zero or more times with new records retrieved from the stream. The KCL supports checkpoint functionality, also. With periodic checkpoints, your record processor stores the state to mark how far it has successfully progressed in processing the records in the shard. This way, if the record processor instance for a shard fails, the new record processor continues processing records after the latest checkpoint for that shard. shutdown – called one time at the end when there are no more records to process or when the record processor is no longer processing records for the shard. Your application-specific clean up logic can be put in this function. For example, you can close or clean up resources that you may have created in the initialize function. If the shard has no more records (shutdown reason is TERMINATE), then you should also checkpoint the final state to notify the KCL that all records for the shard have been processed successfully. // Your application specific initialization logic. // Sample code for record processing. // Data is in base64 format. // Record processing logic here. // Checkpoint last sequence number. // completeCallback to process more data. Now the only remaining task is to write the code that invokes the KCL with your record processor implementation. As previously mentioned, the Amazon KCL for Node.js uses the multi-language protocol (MultiLangDaemon) for the core KCL functionality. To run the Amazon KCL for Node.js application, you need to invoke the MultiLangDaemon with a properties file. The MultiLangDaemon is implemented in Java and requires the Java Runtime Environment (JRE) 1.7 or higher. The properties file passed to the MultiLangDaemon specifies different KCL configuration options such as region, the stream name to be processed by your KCL application, AWS credential provider, etc. To view the sample properties file, see the “samples” directory in the GitHub repository. A bootstrap script is provided in the KCL module’s /bin folder and will run the Amazon KCL for Node.js application for you. After you have your Amazon KCL for Node.js application and properties file, you can invoke the following command to start the consumer application (this command assumes that you have the /node_modules/.bin folder in your path). Another Amazon KCL for Node.js consumer application with sample properties file can be viewed at the GitHub repository. If you would like to explore a more complex application, the repository also contains a sample click-stream producer and consumer.